Although babies' vocal cords are adapted to crying, prolonged crying can damage the vocal cords by causing nodules, irritation and pain, according to pediatrician William Sears. The website for Tampa-based Pediatric Otolaryngology explains that the vocal cords are v-shaped muscles located near the Adam's apple that control the voice. When these muscles are damaged, a baby may become chronically hoarse and experience pain. 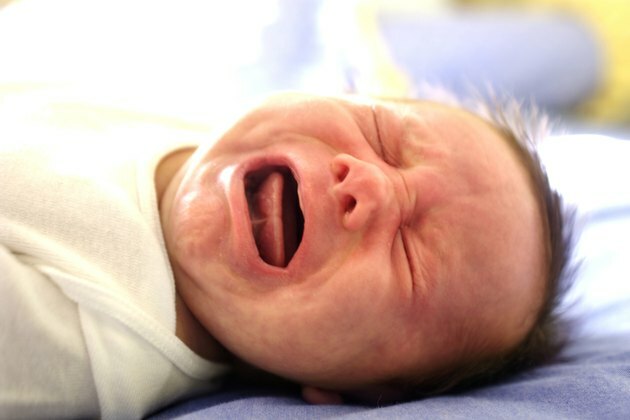 The textbook "Child Psychology" argues that babies are adapted for crying. They instinctively and reflexively cry when their needs are unmet and when they are bored, lonely or frightened. Normal crying, according to Sears, does not damage a baby's vocal cords. The vocal cords are lubricated by the same mucus that lubricates the throat, and this mucus protects the vocal cords from damage during normal use. Vocal cord nodules, according to Pediatric Otolaryngology, are bumps that are very similar to callouses. Excessive crying or screaming might cause vocal cord nodules. Other risk factors include respiratory infections, endocrine problems and allergies. Babies with vocal cord nodules often have hoarse, breathy voices. However, hoarseness does not always indicate the presence of nodules. Prolonged crying can cause other vocal cord problems. When children cry excessively, they may temporarily strip the protective mucus lining the vocal cords, according to Sears. This causes short-term hoarseness but normally goes away after several hours. If, however, children continue crying, their vocal cords can suffer long-term damage. Vocal cord paralysis, a condition in which the vocal cords cannot move with one another, is not caused by crying. Some babies suffer from this condition as a result of genetics, viral infections and other health problems. Sears argues that babies should not be left alone to "cry it out." He points to the fact that babies cry in response to an unmet need, not to test their parents or defy authority. "Child Psychology" explains that there is much debate around crying, and some experts advise teaching a child to self-soothe by allowing brief periods of crying. Even experts who advise allowing children to cry, however, caution that children should not be left alone to cry for extended periods of time. If your baby's crying grows more severe after several minutes, if she is sick or if she sounds hoarse, help her stop crying by holding her and tending to her needs. What Are the Injuries When an Infant's Head Isn't Supported? What Muscles Are Used When Coughing?